The Case of the Frightened Lady at Theatre Royal, Brighton. Photo: Pamela Raith Photography. It’s easy to be snobbish about plays like The Case of the Frightened Lady. They are, by their nature, unadventurous. They are ITV Sunday night drama made live: a bunch of actors of varying degrees of recognisability put in expensive-looking settings and period clothes, and set about killing one another for convoluted reasons. But there is a certain charm in their reliability – the guilty get punished and the rest of us go home, untroubled. There’s a reason that shows like Poirot and Miss Marple are on constant rotation on TV, little islands of certainty in a world in constant flux. Taken on its own terms, then, Antony Lampard’s adaptation of the Edgar Wallace original does what it sets out to do. It’s directed with competence rather than flair by Roy Marsden (his third outing for the Classic Thriller Theatre Company, which does pretty much what it says on the tin), and capably performed. Stage and screen veteran Deborah Grant is enjoyably snooty as Lady Lebanon, obsessed with history and family lineage, even as murders start to spiral out around her. Ben Nealon is her spoiled, flighty son, always rushing to or from the stables, uninterested in the marriage his mother is trying to arrange with his distant relative Isla Crane (April Pearson), a young woman whose straitened circumstances put her at the mercy of the Lebanons’ questionable charity. Denis Lill is pleasingly sinister as the doctor who seems to have a strange hold on the family, while Philip Lowrie and Glenn Carter provide able support as the household servants who may know more than they think. (A running joke about the staff constantly listening in doorways is one of the best bits of the night). Making his stage debut, Harry Potter star Oliver Phelps brings a bucketload of gawky charm as the keen and untested Detective Sergeant Totti, his new-fangled ideas about policing a contrast to his more world-weary superior (Gray O’Brien). Julie Godfrey’s set provides the requisite period backdrop, but limiting the action to one room – even one as impressive this – does mean there’s an awful lot of people rushing from one doorway to another, which can make the piece feel cluttered. 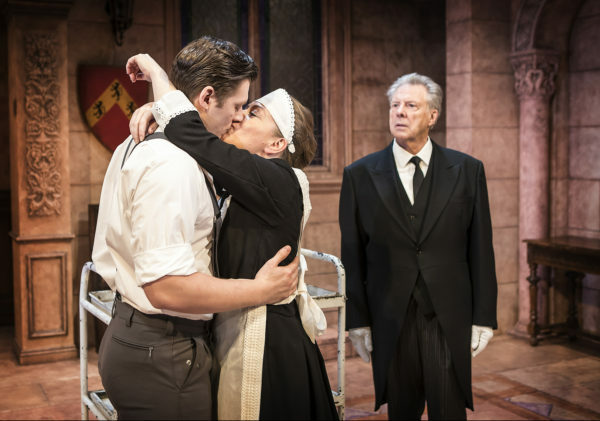 Overall, this is solid fare in the vein of the shows that preceded it (both under the newer Classic Thriller Theatre Company and the earlier Bill Kenwright venture, the Agatha Christie Theatre Company): unlikely to disappoint its target audience, unlikely to convert any doubters. The Case of the Frightened Lady is on until 30 June 2018 at the Theatre Royal, Brighton and then touring. Click here for more details.